This gorgeous ring showcases a shimmering cultured freshwater pearl set on a 9ct yellow gold band, adorned with an illusion set diamond either side. Ideal for adding a touch of glamour to her everyday wardrobe or a beautiful accessory for a formal event. 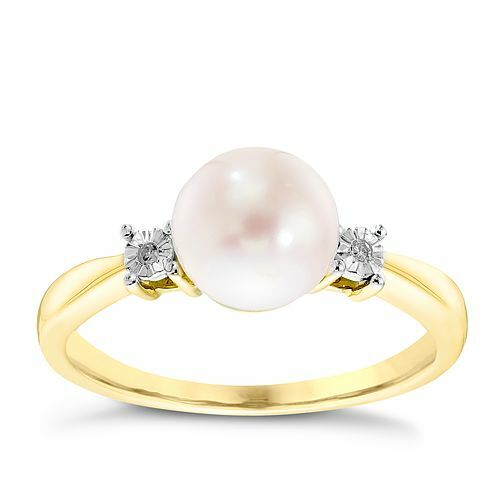 9ct Yellow Gold Cultured Freshwater Pearl & Diamond Ring is rated 5.0 out of 5 by 2. Rated 5 out of 5 by Anonymous from beautiful I bought this for my mum for Christmas, it really is a beautiful ring, I was a little apprehensive when buying it online, but when It arrived I was very, very pleased, its not too big or to small and looks lovely on! Rated 5 out of 5 by Anonymous from Beautiful and unique This ring was bought for me by my fiancé and it is perfect. The pearl is a perfect size and goes perfectly with my gold pearl necklace, also bought from Ernest Jones. I would definitely recommend it, especially as a unique engagement ring.